There were sixteen plus two hikers who arrived this beautiful morn' for a super-scramble among the northern section of the Calico Hills. There was a 40% chance of rain predicted for around noonish. We had a lot of ground to cover before then. 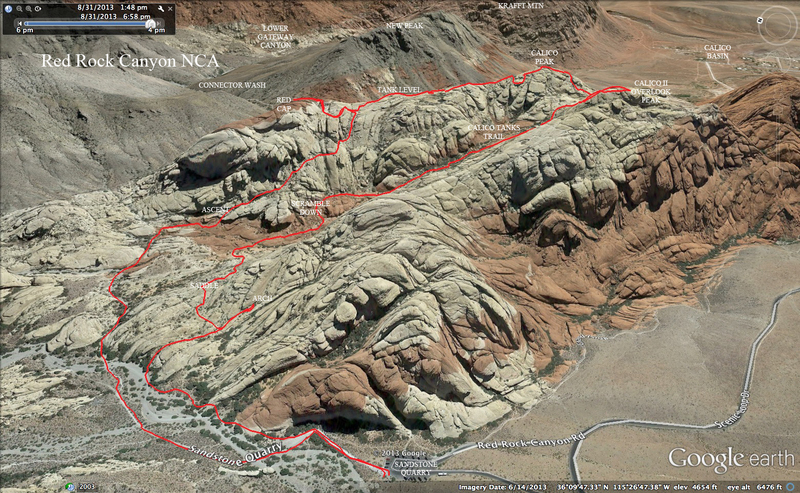 Two hikers decided to stick together and do their own watered down version of today's hike so they were on their own. The remaining sixteen hikers started out from the Sandstone Quarry parking lot off of the Scenic Loop in Red Rock Canyon NCA. We were immediately barraged by disarranged gravel, rocks and dirt. 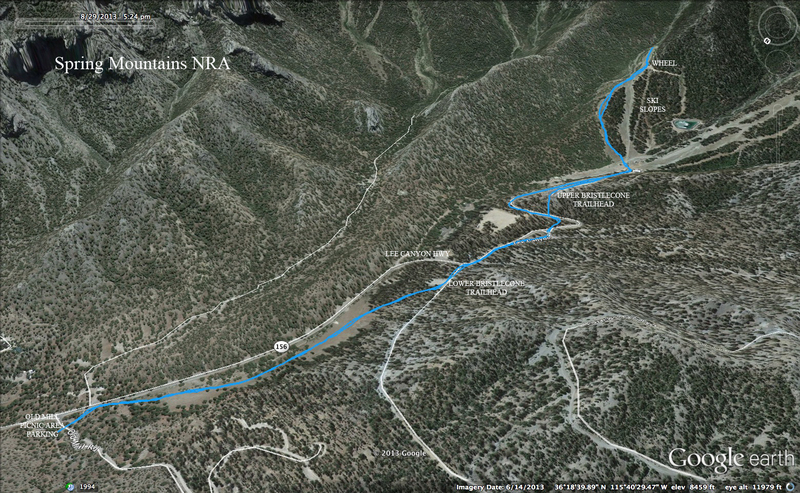 The rains from this week must have formed rivers that ran past Turtlehead Peak and on down toward Hwy 159. Some of the evidence of the storms is seen in the photo collage to the left. One good result was found in the wash that we use to go to the north side of Red Cap. Those treacherous small boulders that filled the wash before are now covered with a very thick layer of gravel. Much easier walking. The energy level was high. We were glad to be getting a TBW ... (Total Body Workout)! 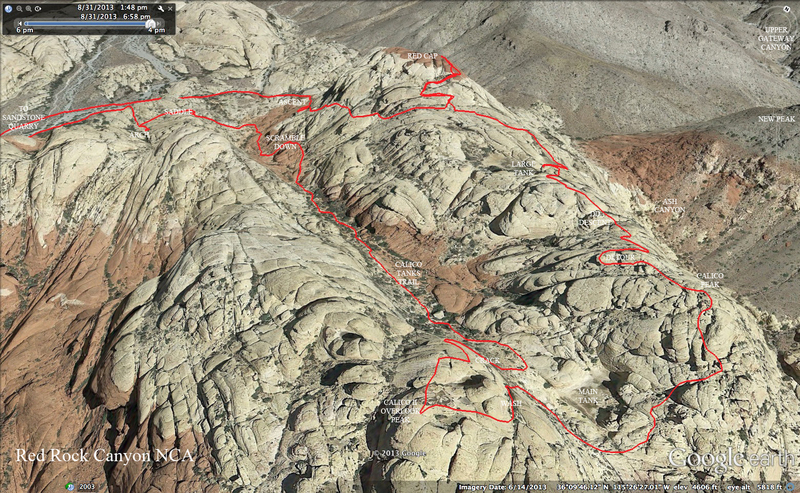 We made our way up the small wash, through the little red canyon and up to the beginning of the Red Cap crack ascent. The long line of hikers queued up to climb up a steep crack, hike through a slanted crack and continue on to the steep sandstone landscape beyond as seen in the photo to the left. The scenery of Red Rock Canyon under the rising sun and cloudy skies was gorgeous! The photos just kept coming! Up, up and up, we climbed until we couldn't climb anymore. We had found the summit of Red Cap (minor). Our clothes were drenched with sweat in the high humidity. We had at least one newbie on the top. Congrats, Carl! We took a small break and started down. We returned to the tank level of the ridge and began our survey of the water levels. First, we dropped down to the left and found Kay's Tank. This tank provides a beautiful reflection of Red Cap when it is full and it was full. Next, we hiked up to the Sundial Tank. It was also very full. 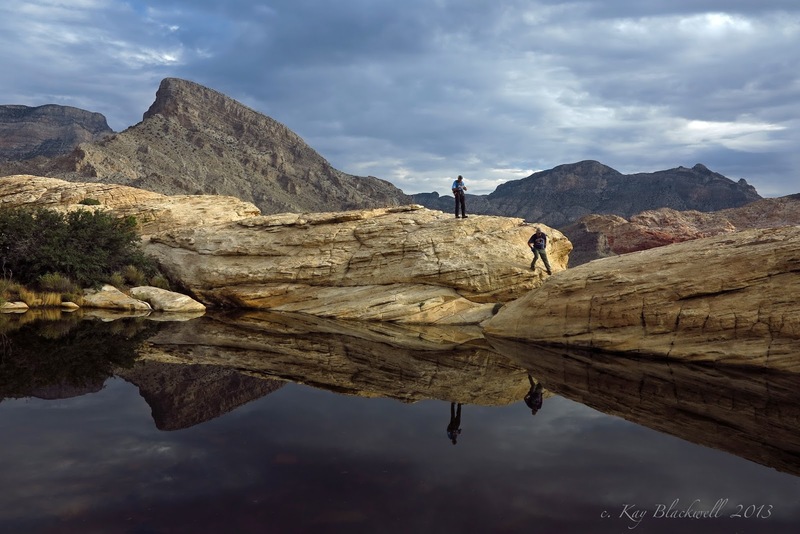 The reflection of Turtlehead Peak and of hikers going by can be seen in the glassy surface of the water. Finally, we peered down to see if the very large tank that rarely has water was full. Nope. It may have had about a quarter of its area covered with water. The photos took themselves as we hiked around the tanks. 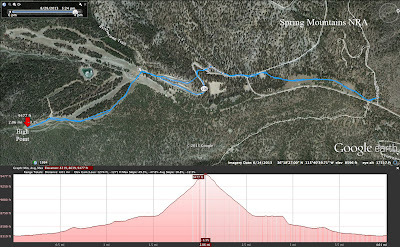 We climbed up the ridge and found the Diane Dempsey Descent! 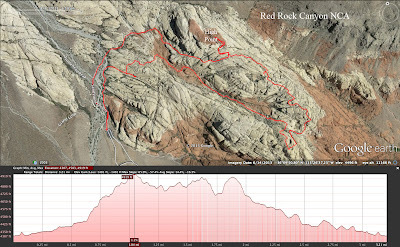 The scrambling route between the tanks and Calico Peak include three steep descents but the first one is the highest. The top photo below shows the hikers' view at the top. Yep. Straight down! 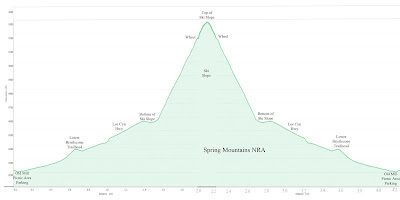 If you keep a fairly straight route over the ridge, you can get to the last climb up to the peak. 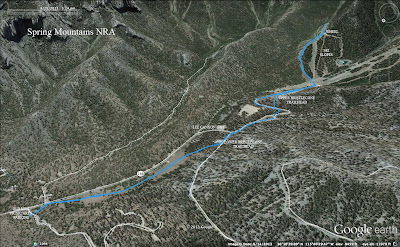 From here, the route serpentines around obstacles. 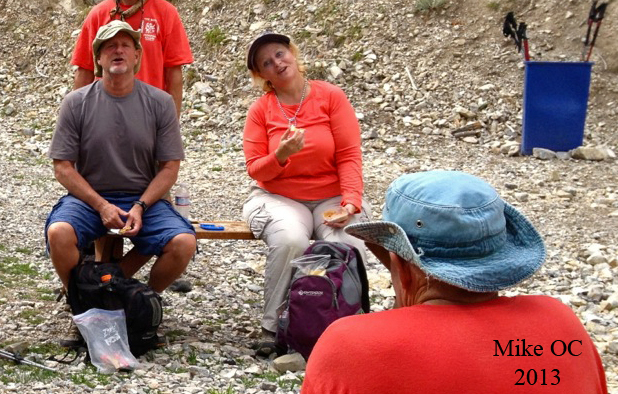 The high point of Calico Peak offers a log book and we all signed in. This was our main break spot. We sat there and checked out our next route that we could see across the canyon in front of us. Still going in the ridge direction, we passed the infinity pool in the photo to the left and dropped down a particularly hairy section of downward scramble. What you can't see in the photo below is a 500 foot drop off to the left. 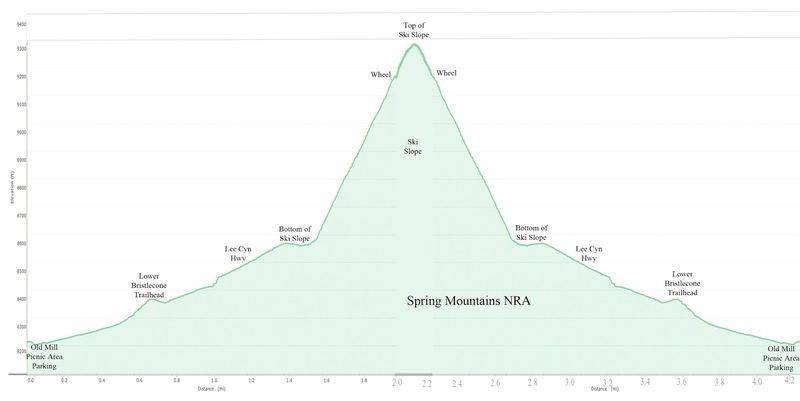 (Okay, maybe 200'.) We hung on tight and were very careful with our footing. The group of hikers we had today were very experienced. There's a 500' drop off to the left there! 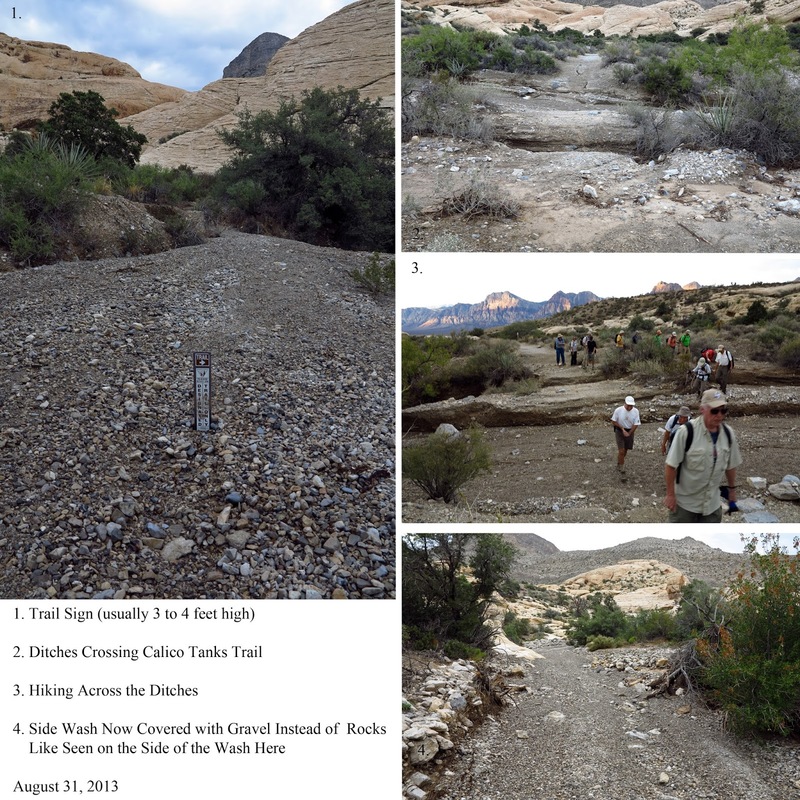 We were well aware throughout the hike that the wet sandstone could easily break under the right conditions. We finished our drop down to the main Calico Tank via a steep yet safe crack. From there, we crossed over the east and south side of the large tank (not full). 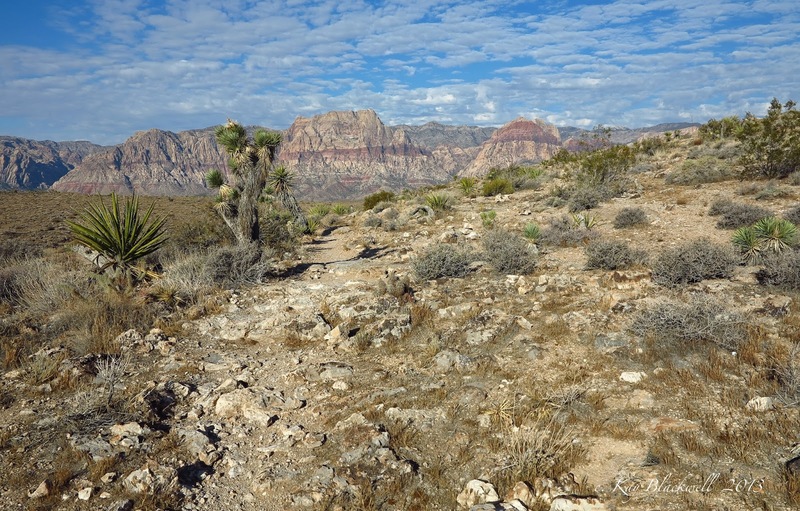 We arrived at the wash crack that would take us up to Calico II Peak and began another steep scramble. The humidity and scrambling were beginning to take their toll on our bodies. The Spring Mountains are great but the Red Rock scrambling uses a lot of different muscles. 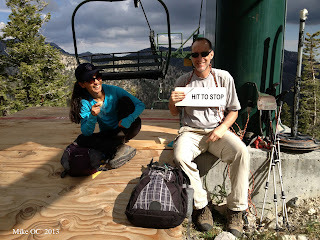 Nevertheless, we made it up to the peak and took another small break. 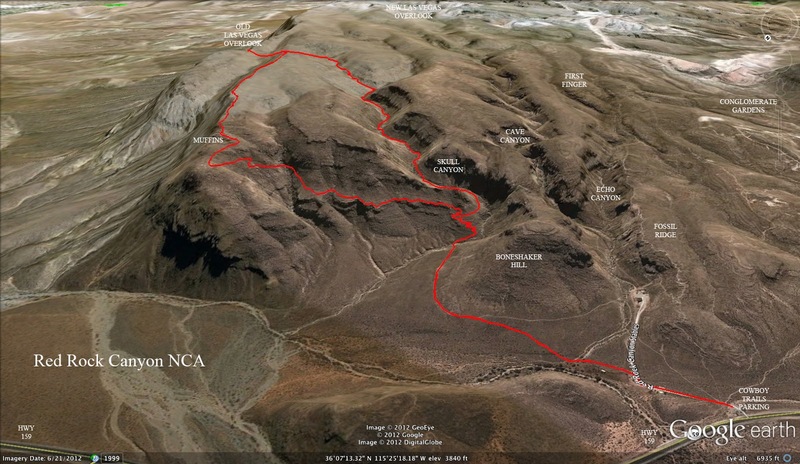 There are three large tanks in the vicinity of Calico II Peak. They all have water but they are not half full. Clouds were beginning to peep over the escarpment in the distance but we knew we still had a lot of time before rain would start. Our hike was not rushed even though it was clear that we were all enjoying this hike very much as we climbed here and there and everywhere. 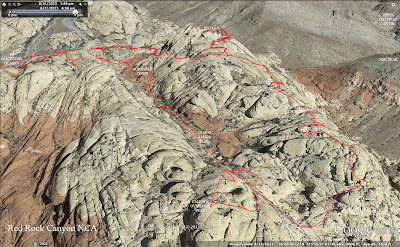 After our break on Calico II Peak, we decided to descend via the Calico Crack. Past the hot tub tank and over the side of the high sandstone, we defied gravity and found the popular crack descent. Challenging but easy enough. By this time, we had thirteen hikers coming down the crack with two hikers waiting for us at the main tank. 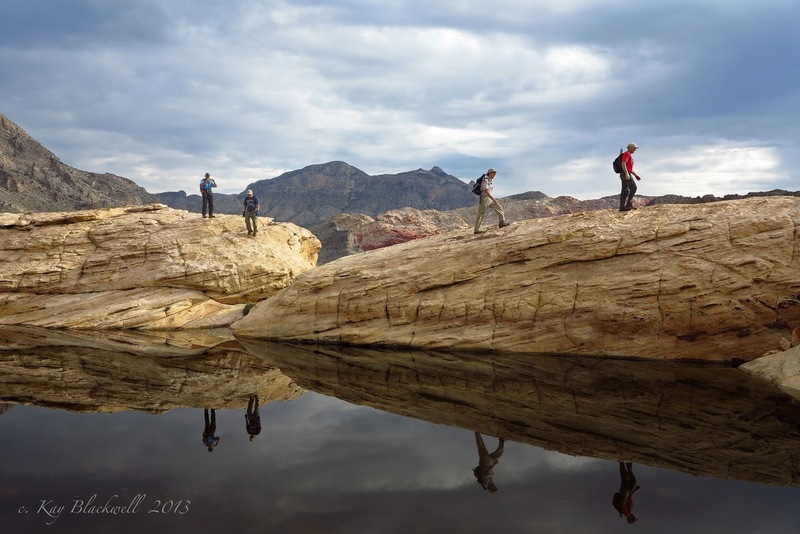 The exposure on this hike tends to send some hikers in different directions. Fifteen hikers descended by way of the Calico Tanks Trail using scramble descents when possible. 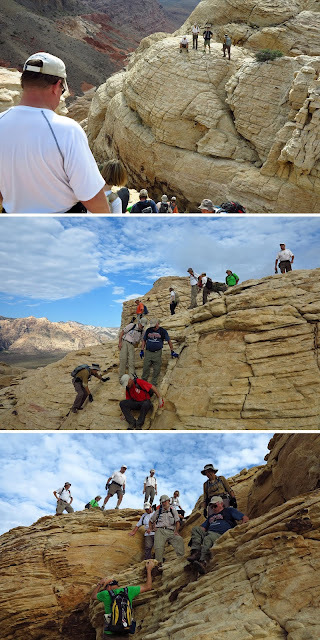 After much of the descent had passed, we found the saddle above the arch and climbed up and over it. The arch was the next and final small break of the hike. The sun had come out. We were fading. The shade of the arch was nice for a few minutes then we headed back out to the cars. Whew! What a great morning! 3.5 hours. 3.8 miles. And, 1300 feet of total elevation gain. 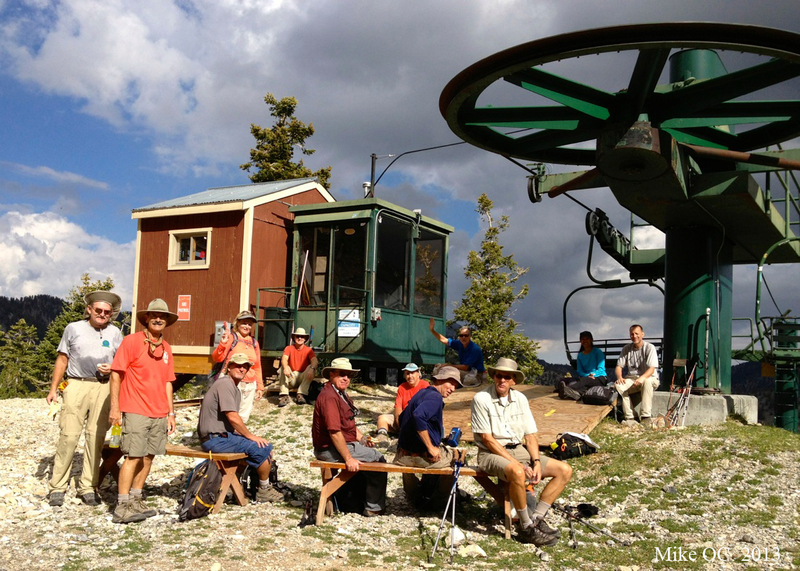 A baker's dozen gathered at the Old Mill Picnic Area for a Thursday jaunt to the ski area. 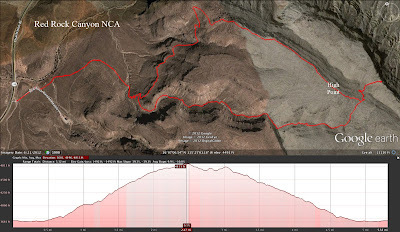 Today's trek was a mere prelude, a preview if you will to next Tuesday's affair. Leaving the construction site at Old Mill, we ambled upward through the meadows to Lower Bristlecone, passing three wild horses along the way. 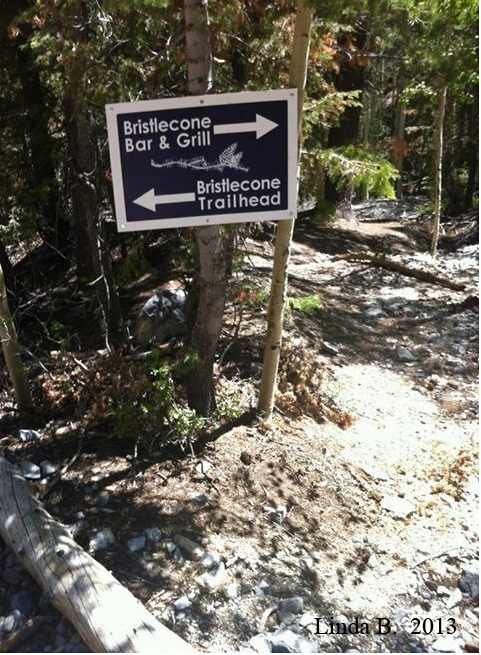 Dodging some construction equipment, we serpentined through the woods, soon arriving at Upper Bristlecone. A mere quarter-mile up the Bristlecone Trail, we looked for the sign pointing us to the BAR. Someone stole it. Damn! Undeterred, we nonetheless took the detour to the ski area. Not a whole lot of activity at the lodge at 8:30 in the morning. Count 'em--not one, but six porta-potties at the bottom of the ski lift. Mandatory stop. The real hike begins here, as a thousand foot of steep, vertical terrain lay before us. 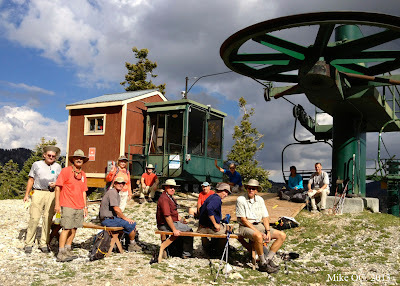 Onward & upward we ascended under the shadow of the chairlift. Just past the top of the chair, we gazed upward at next Tuesday's route--the daunting pitch leading up to the North Loop Trail. But that's another time and another day. For now, lunch under the bull-wheel beckoned. Ski Lee Part 1 was in the books. Stay tuned for Part 2. 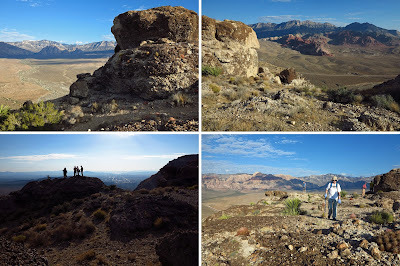 This morning's Early Riser hike to the Muffins and Skull Canyon presented sights to behold! The sun rose on a clear sky which slowly changed to small puffy clouds then big puffy clouds. 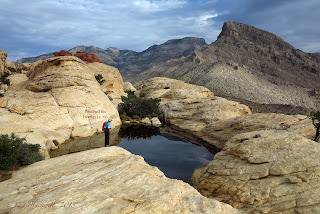 The air was cool but extremely humid and our bodies leaked water throughout the hike ... somewhat unusual for the Las Vegas desert. We parked at the Cowboy Trails trailhead on Highway 159 in Red Rock Canyon NCA and began our hike past the horse corral. Tails were switching all over the yard as the horses did their morning routine. As per instruction, we climbed up to the Muffins at our own pace enjoying the shady side of the North Blue Diamond Hills. There was a large group of the fifteen hikers leading the way, then the rest of the hikers were spread out over the side of the hill. When we reached the large conglomerate caliche rocks we call the Muffins (because of their shape) most of us were rewarded with a nice long break while we waited for the last hikers to arrive. We climbed over on the overlook rock and viewed the Las Vegas Strip through the rising sun. The sunlight for photos at the Muffins, was optimal. 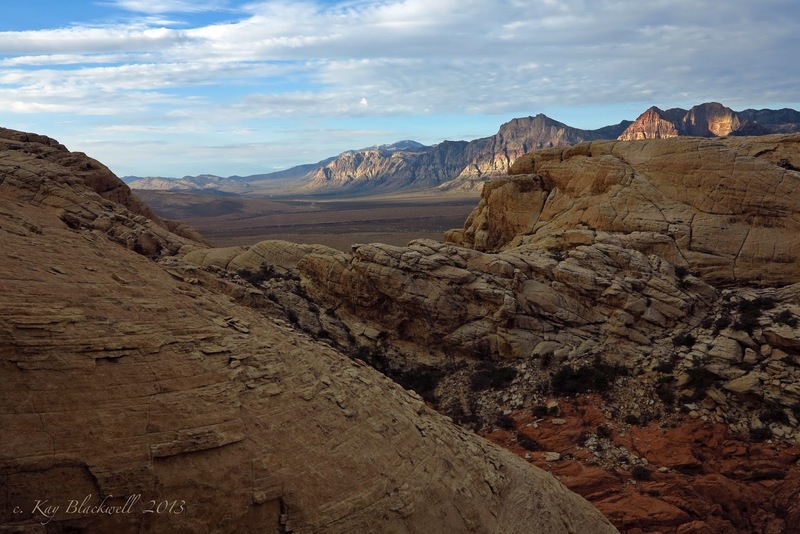 Colors popped and the sky was doing its little puffy cloud act over the Red Rock Canyon escarpment. While we waited, Roger taught us how to use his special mirror to signal helicopters. (There's a piece of knowledge that no one hopes they get to use!) Finally, the last two hikers arrived and after a couple more minutes, we began hiking up the ridge on a trail that fades in and out near the left side. There were several small sea fossils embedded in the rock around us. 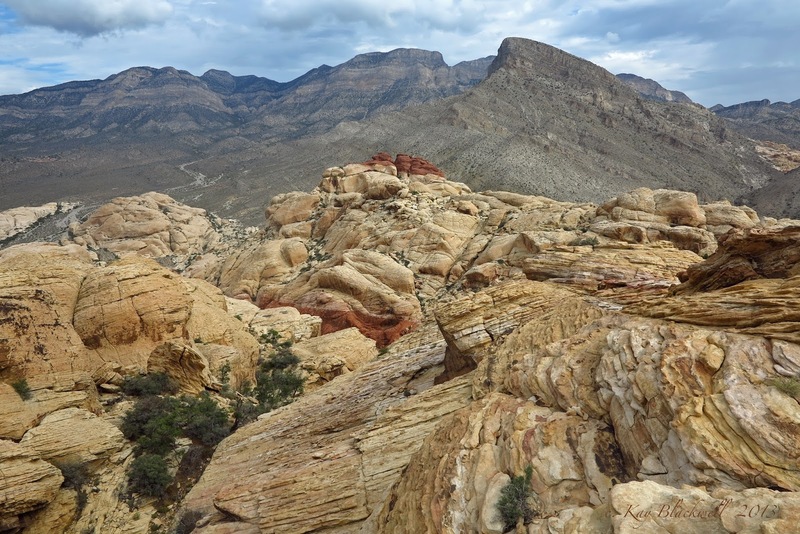 The ancient black chert, younger cacti and yuccas finished out the landscape with the background scenery of the Calico Hills and escarpment. When we stopped to wait for the slower hikers, happy faces turned to the camera. Our weak ridge trail T-boned into a stronger trail and we turned left. This trail led us down and up to the Old Las Vegas Overlook where we took our official morning break. Most of the hikers climbed up to the rocks to the right of the overlook as seen in the photo to the left. The photo below was taken on the hill to the left of the overlook. The sky was becoming more and more gorgeous as a weak weather system approached the Spring Mountains. We have had quite a bit of rain this week and this is the tail end of the monsoon run. After our break, we returned to the T-bone and continued hiking down to the top of Skull Canyon where we then took a turn to the right into the canyon. The descent down Skull Canyon is a trail all the way, however, the hiker has the option about half way down to scramble down the middle of the wash. Some of us mixed up our descent ... a little of this and a little of that. When we got down near the bottom, the canyon dropped more steeply than the trail. But, soon, we were also dropping as we passed the Muffins trail turn off. When we reached the floor, the pace sped up and we got back to the cars quickly. After an almost 6 mile hike with 1300 feet of elevation gain, the weather had heated up and we were happy to have finished before the heat of day had really set in.